Going to the salon in Santa Fe, NM just improved for the a variety of Santa Fe residents because Alan Hutner, founding host of Transitions Radio Magazine on 98.1 FM, Radio Free Santa Fe, KBAC, is launching a new live interview radio program called Santa Fe Salon Live. Starting at 6 p.m. Wed., March 7, the first ever Santa Fe Salon Live guest Kathy Walsh, a children’s book author, social media guru and Transitions Radio Magazine team member, will be interviewed by radio host Alan Hutner. 98.1 FM, Radio Free Santa Fe, KBAC. KBAC , one of the flagship stations of Hutton Broadcasting of Santa Fe, New Mexico, has a live stream link on company-owned SantaFe.com, Santa Fe’s premier visitor's guide on the world wide web. Transitions Radio Magazine can be heard live from 8 to 11 a.m., on Sunday mornings on 98.1 FM, Radio Free Santa Fe, KBAC. "We are really looking forward to lots of great guest interviews on Alan Hutner's new Santa Fe Salon Live show on 98.1 FM, Radio Free Santa Fe, KBAC. Alan Hutner is a great interviewer" states Hutton Broadcasting and SantaFe.com owner and general manager Scott Hutton. 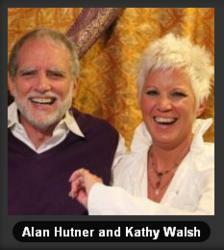 Alan Hutner is an acclaimed show host, interviewer and conversationalist who has been at the forefront of Santa Fe's radio and multi-media community for the past 28 years, as well as broadcasting globally now at http://www.transradio.com as part of the Hutton Broadcasting Group. The list of guests on his show has included Neil Donald Walsch, Deepak Chopra, Marianne Williamson and numerous other best-selling authors. Kathy Walsh has always been ahead of the curve. She was the hottest buyer for the "B Stores" in New York City - Bloomingdale's, Bendel's, and Barney's - until a cosmic two-by-four knocked her on the head and sent her on a different path. In Santa Fe, she pursues her passions for marketing and children. Her newly released Spiritually Savvy Kids book series is on sale at Collected Works.